The Internal Revenue Service is turning to Twitter and YouTube to reach taxpayers this year in an effort to increase online information about filing taxes as the agency faces an abysmal customer-service rate. Strained by budget cuts and a declining staff, the IRS plans to direct more taxpayers to the Web to try to reduce the burden on its ill-equipped call center, IRS Commissioner John Koskinen told USA TODAY in an interview Monday. YouTube videos posted in recent months explain how the free file program works and give advice to first-time filers. The IRS Twitter feed is filled with links to commonly asked questions and answers and information about the effect of health coverage on tax returns this year. In addition to social media, the tax body has also increased the capability and advertising of its website features. That includes the “Where’s My Refund?” application that the IRS launched last tax season to let people check the status of their refunds. The goal: more people finding answers to their tax questions without talking to anyone in person. The IRS expects nearly half of the calls it gets this season to go unanswered. Wait times for those who get through will push 30 minutes. Encouraging more people to e-file will also alleviate some of the load for IRS employees. In 2014, about 85% of filers e-filed. But it’s the remaining tens of millions of tax returns filed as hard copies that take more work and time to process. Refunds for those who file paper returns this year are expected to be delivered within seven weeks, if not longer. 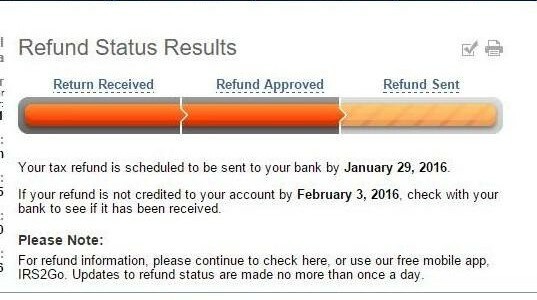 E-file refunds take about three weeks to be processed. The goal of putting as much information as possible online is also to decrease the probability of people making mistakes, so returns and refunds are both processed more quickly, Koskinen said. Although, more online returns and refunds also means more opportunities for cybercriminals, particularly “very sophisticated” organized crime rings, Koskinen said. The IRS has taken steps to partner with state and local law enforcement in the past three years, and has “thrown a couple thousand people in jail” in recent years. Last year, the tax group stopped $18 billion in refunds tied to false tax returns, but Koskinen estimates the IRS is still losing $3 billion to $5 billion a year to fraudsters. “It’s much more under control, but it still concerns us,” he said. This is also the first year the Affordable Care Act factors into tax returns. While most taxpayers simply have to verify that they have health insurance by checking a box, Koskinen said that about 4.5 million of the 150 million returns expected to be filed will involve additional paperwork related to tax credits that offset insurance premiums. Though since “flooding the zone” with information for consumers and tax preparers starting last spring, the IRS is now expecting fewer calls related to the ACA than it originally projected, down to 5 million from an estimate of 11 million.